If I could renovate our 13-year-old kitchen tomorrow, I would choose classy white Italian Carrara marble counter tops. 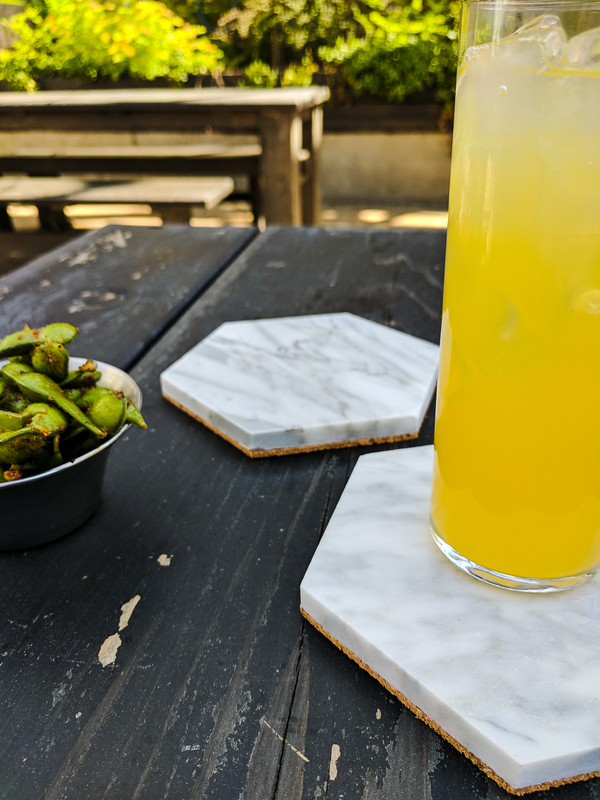 Until then, I made myself some easy and modern DIY hexagon Carrara marble coasters on the cheap that cost just $6 a piece. 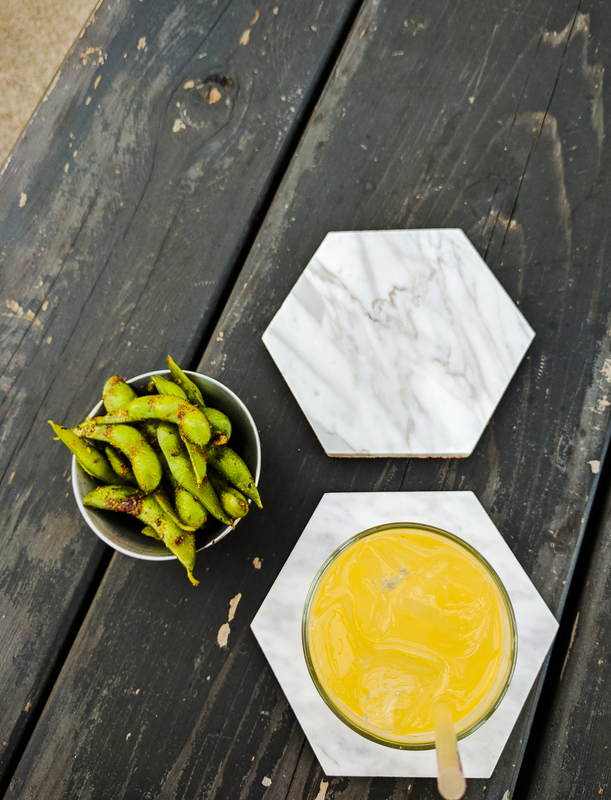 Wouldn’t these hexagon marble coasters make a great DIY Mother’s Day gift? 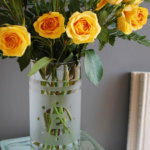 I would want them, wouldn’t you? 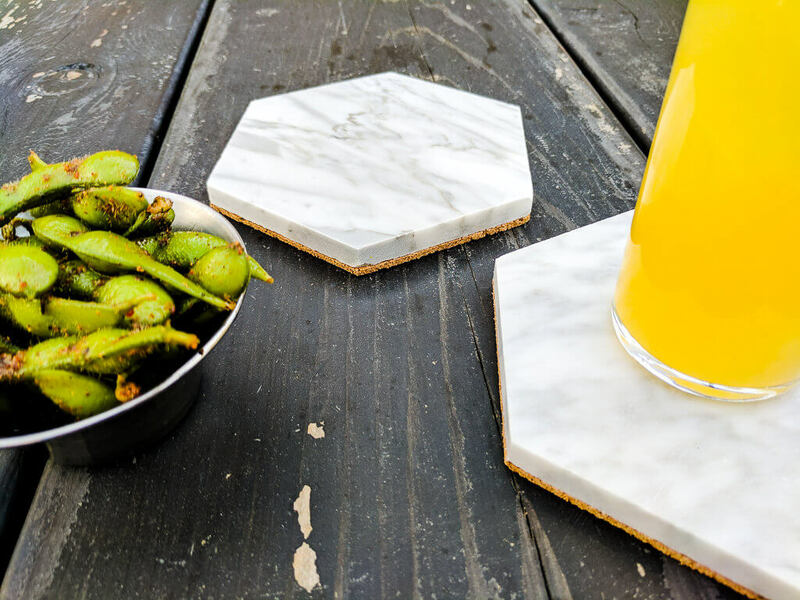 Making these DIY hexagon marble coasters are so easy that it feels weird writing a “tutorial” on how to do it. 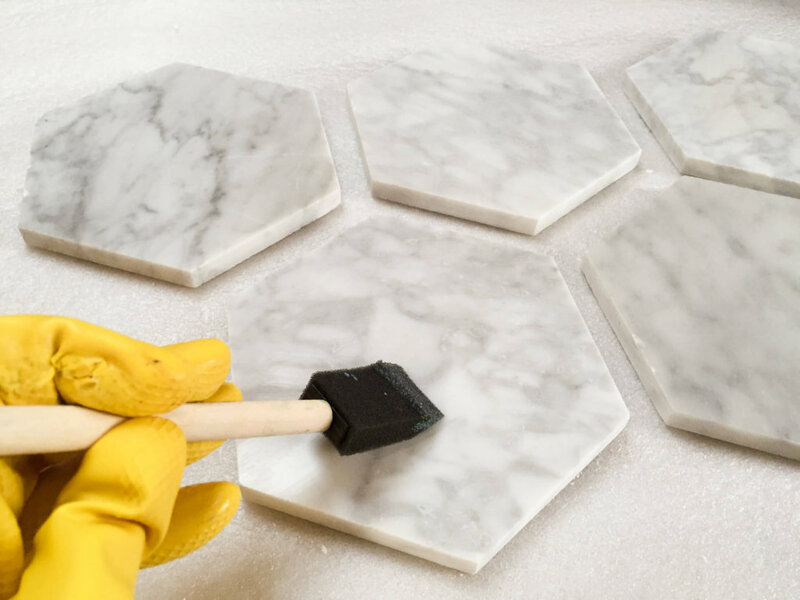 It is so quick and easy: just glue cork or felt on the bottom of hexagon-shaped white Italian Cararra marble 6″ tiles (affiliate). Isn’t it easy? Almost too easy. 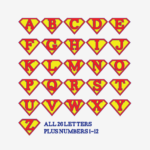 I mean, as much as I covet simple things I have been known to over-complicate my crafting. 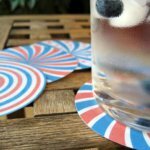 Anyway, I originally made these coasters 4 years ago (and they guest-starred in my DIY Kentucky Derby horseshoe etched beer glass tutorial) and I’m finally writing up the DIY marble coaster tutorial. 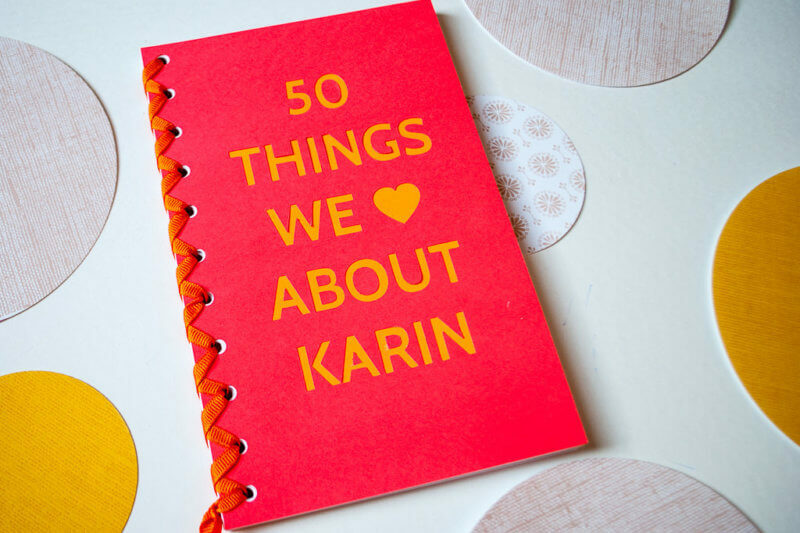 Pretty embarrassed that that it took me so long to share this easy DIY gift with you. 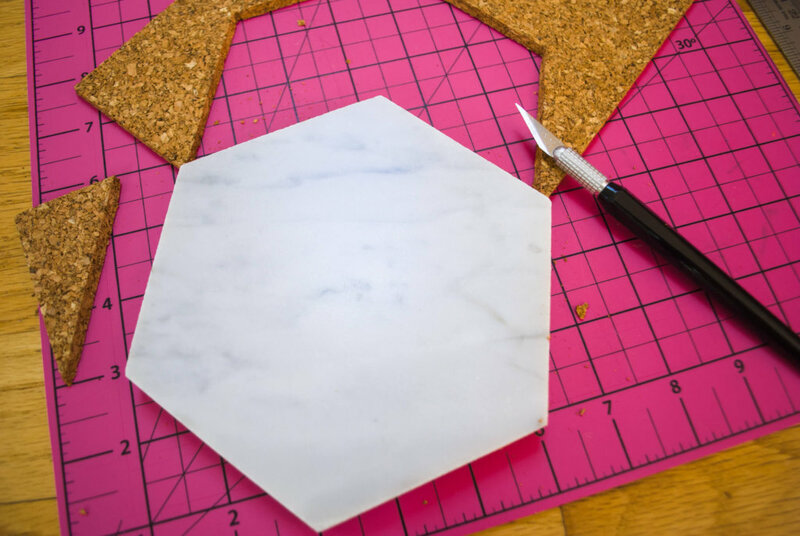 I saw these similar hexagon 8″ marble trivets with leather bases down the street at one of my favorites stores, unison, that retail for $88. Yikes! 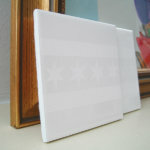 Well, I really need some new coasters so I decided to make some in a coaster size. Mine cost more like $5 each to make myself. 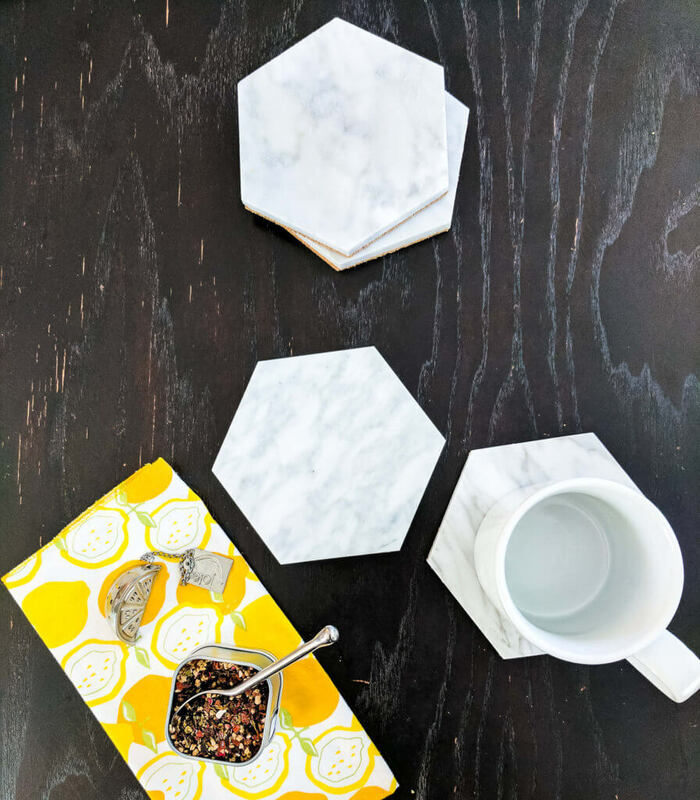 I also gifted a set of DIY hexagon coasters to one of my favorite instagrammers/quilters/bloggers, Nicole at Modern Handcraft. Doesn’t it look right at home in her kitchen? I found two types of Carrara marble tiles for sale on Amazon: honed which is a matte finish, and polished which is shiny. I wanted mine to be matte so I went with honed. If you decide to go with polished, then you can skip the sealant step. Even easier. 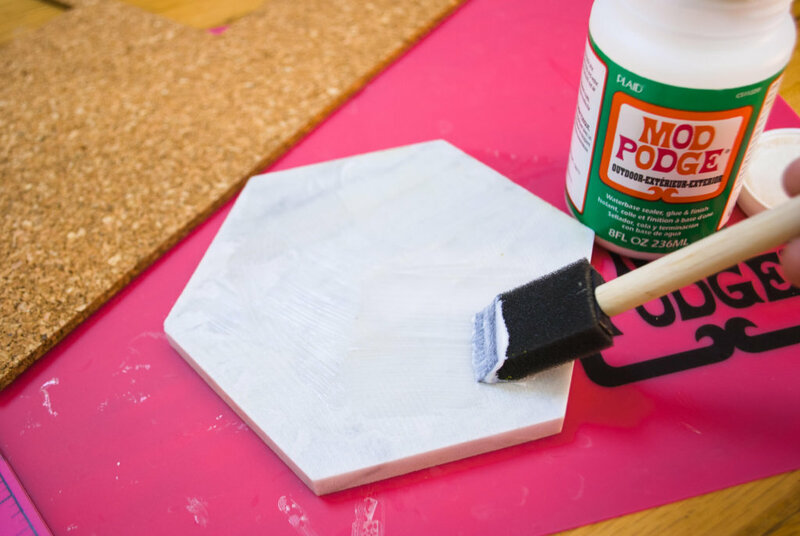 I contacted the tile manufacturer about my matte hexagon tiles and they recommended sealing honed tiles to prevent staining. I used some leftover sealant from our bathroom marble. 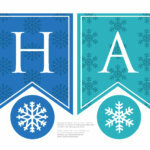 Apply two thin coats following package directions, and let it dry overnight. 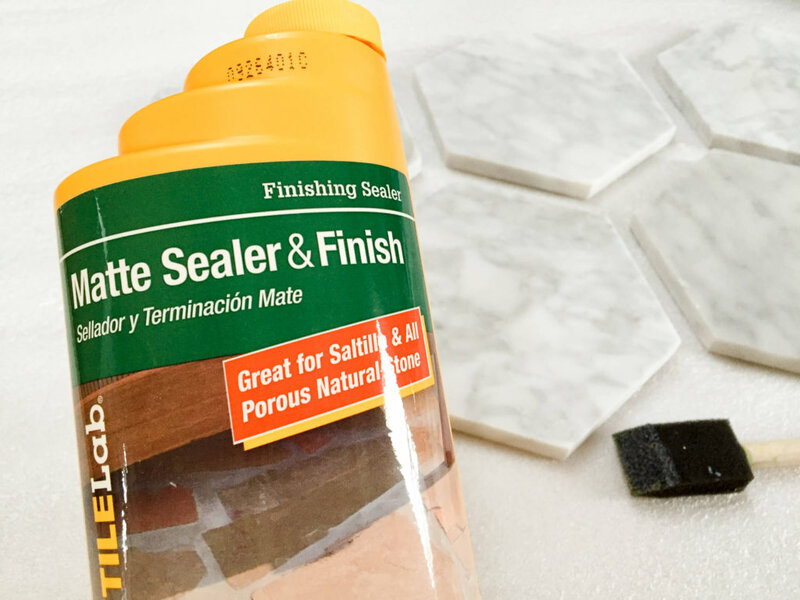 Place your dry marble tiles wrong side up. 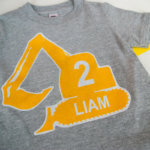 Paint a decent amount of Mod Podge on the back, making sure to cover all bits and all the way to the sides. 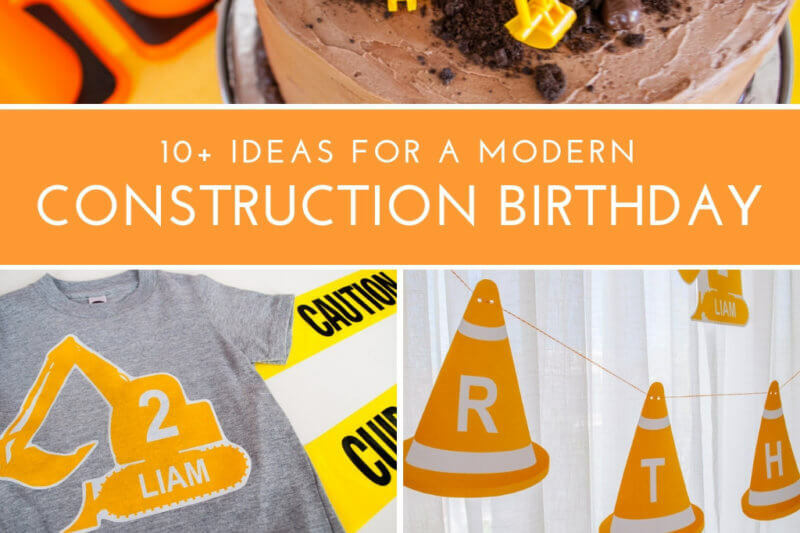 Work quickly because Mod Podge can dry fast. 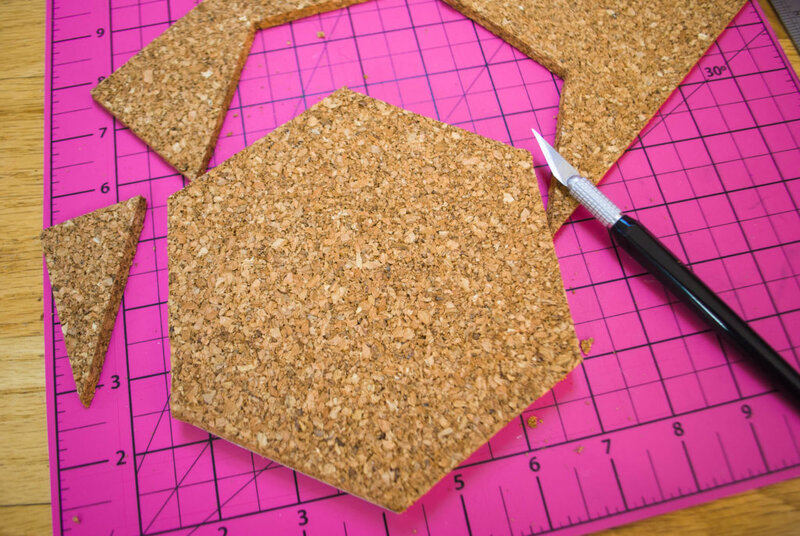 Place it glue-side down onto cork. Or for a different look, you could use wool felt. Let it dry. Make sure the cork is adhered well before moving on to the next step. 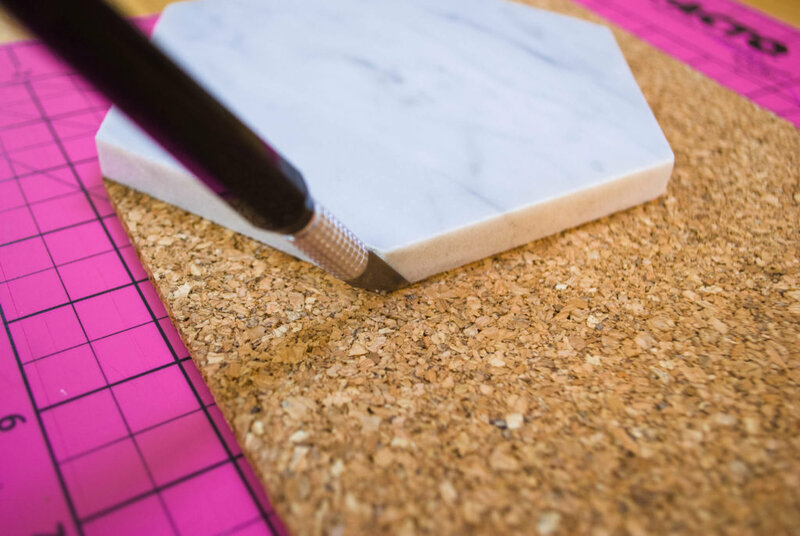 Run your craft knife close to the hexagon tile to cut it out – be sure to use a self-healing mat. And that’s it. 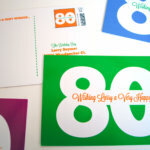 Wasn’t it too easy to make something this classy?? 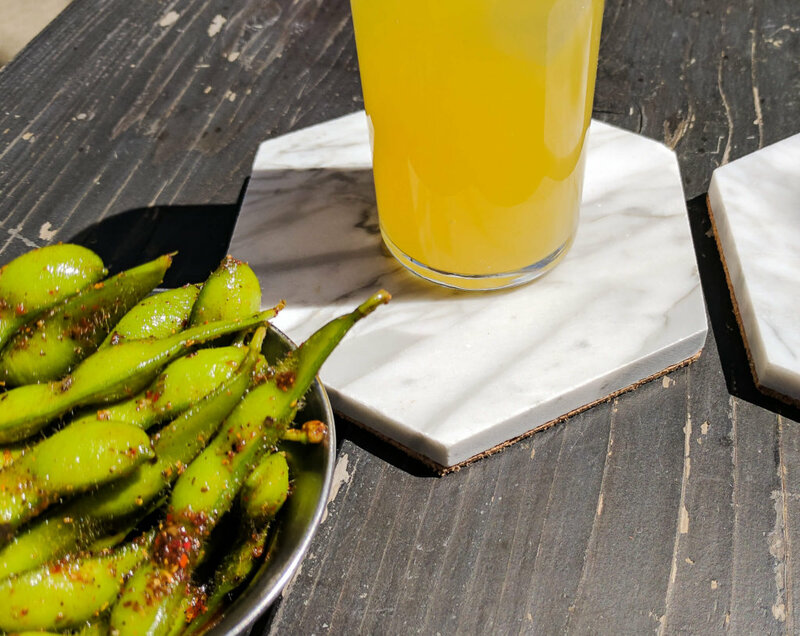 Tell me in the comments below: what is your favorite drink to put on a coaster?